Get your very own pet Dino! Dino walks, talks, wiggles his tail, breathes and blinks - with lifelike animation and funny sounds. ◉  Tickle his tail, paws and tummy! ◉  Slap him on the head playfully! ◉  Jump on his squeaky bed! ◉  Put him to sleep (and turn on his bedside lamp)! ◉  Run around his playroom! ◉  Play with his ball and other toys! ◉  Put on awesome costumes! ◘  Tickle him several times and he laughs harder! 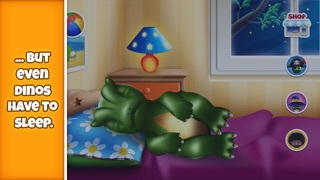 ◘  Dino sleeps best at night! Try putting him to sleep in the evening. ◘  Try to visit Dino's playroom while wearing a costume! ◘  Fun toys and accessories are available at the Dino Store! ◆  Beautiful retina graphics and lifelike animation on iPhone or iPad. Looks perfect on the iPad mini! ◆  Promotes healthy sleeping habits. by Tapps Tecnologia da Informacao LTDA. My Dino Pet - Talk and Play with Baby Dino!